7 million people became victims of identity theft last year. Two out of five travelers admit that they aren’t as careful about online security when they are on vacation. 55% of travel identity victims spend weeks to more than a year working to resolve issues. Minimize your risk of identity theft while traveling by securing your home, personal information, credit cards, and mobile devices. Before you finalize plans for your next trip, brush up on tips to safeguard your identity information. 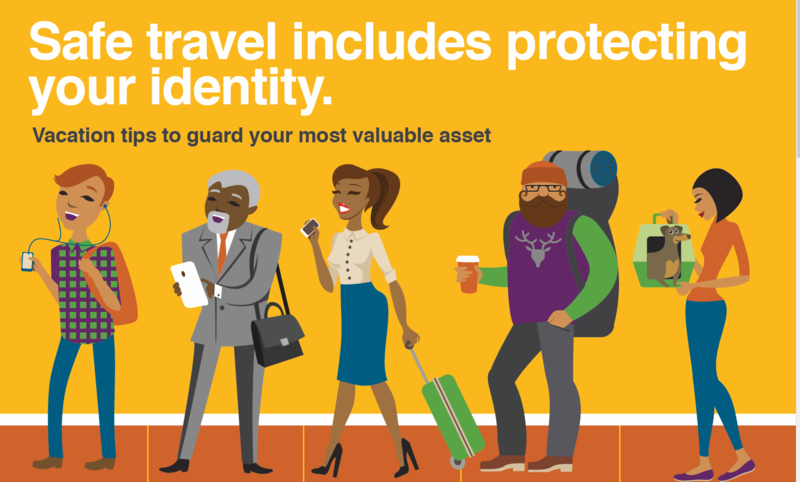 Download our infographic and get proactive advice for travelers. Suspect you’re a victim of identity theft? Many insurers, banks, credit unions and employers offer CyberScout identity management services for low or no cost. Call your provider and ask to be connected to a fraud specialist. “2018 Identity Fraud: Fraud Enters a New Era of Complexity,” Javelin Strategy & Research, February 2018.
International Travel Report, Kaspersky Lab, June 2016. Survey for Experian conducted by Edelman Intelligence, March 2017.